Mrs. Angela Hobson (l to r), senior Natsuho Kaneshiro, and senior Emelie Schuessler enjoy sweet treats. Hobson hosts the two exchange students. German exchange student Emelie Schuessler enjoys what most can’t do. Since experiencing new cultures and people intrigues her, she loves traveling. With blonde hair, she is timid but polite. 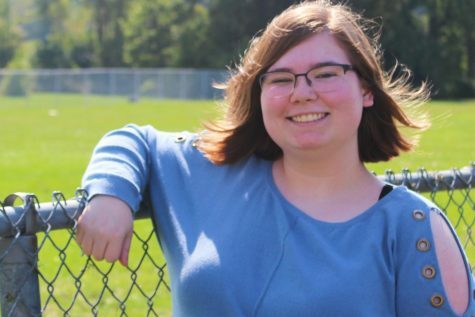 Even though naming her favorite food came with some hesitation, she spoke with confidence, especially about her activities at home like playing volleyball, guitar, and piano. She has continued these activities in America by joining the volleyball team. One thing that stood out about Schuessler is that she wants to travel to as many countries as she can. Schuessler believes that traveling to America helped her experience more culture and diversity. Even with the love of the country in her mind, her heart belongs to her family back in Germany, whom she misses. “I could imagine (myself) in the United States for a longer period of time, 10 months (at most), but I wouldn’t last longer than that because I can’t live without my family,” Schuessler said. 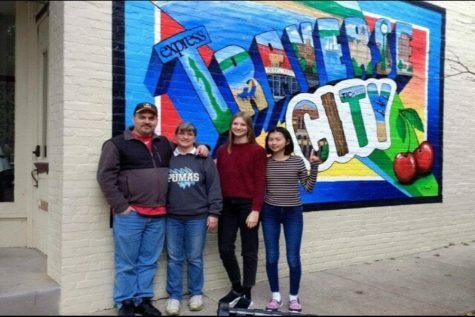 Senior Emelie Schuessler (second from right) poses with her host parents and senior Natsuho Kaneshiro in front of a vibrant piece of art in Traverse City. It showed through the interview that her family meant a lot to her, mentioning their last moments before she set off to America. Her family consists of her mother, Mrs. Kerstin Schuessler, her father, Mr. Markus Roehr, her sister Nina Sczepurek, and her brother Nils Sczepurek. 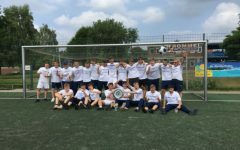 Schuessler has visited 12 countries. All are in Europe, with the only exception being the United States. One country that caught her eye was Sweden. She was captivated by the many people there and the geography of the whole country. She plans to return soon. Her host family, the Hobsons, welcomed Schuessler wholeheartedly. Schuessler said her host family is kind, and she is happy to live with them. The Hobson family includes parents Mr. and Mrs. Thad and Angela Hobson, as well as sisters Hannah Hobson and Heather Hobson. The family has two furry companions, golden Labradors named Lola and Nana, whom she enjoys taking photos of and hanging out with. 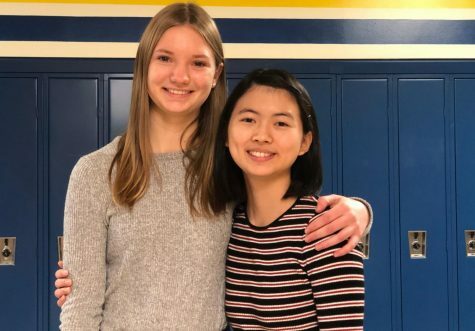 Not only hanging out with the dogs, Schuessler hangs out with her best friend in America, who is also an exchange student staying with the same host parents. German exchange student Emelie Schuessler (l) hugs her best friend Natsuho Kaneshiro,a Japanese exchange student. Kaneshiro enjoys Schuessler’s company and feels they will continue to be friends after this year ends. 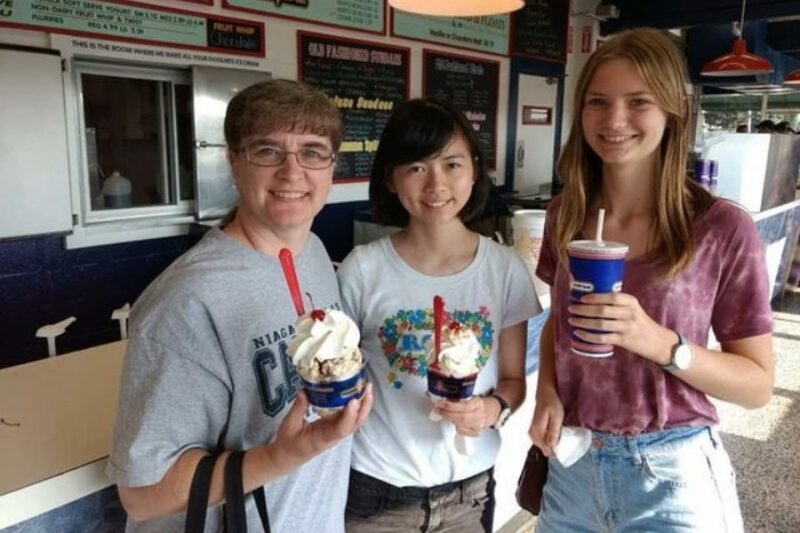 Natsuho Kaneshiro, a foreign exchange student from Japan, became best friends with Schuessler quickly because their host family was able to take in two students. Kaneshiro’s first impression of Schuessler was her appearance and later her personality. Since Kaneshiro and Schuessler are living together with their host family, they have become great friends in a short amount of time. But sadly the school year ends June 6. This leaves only months of hanging out before they return home to their families. But this doesn’t stop Schuessler’s desire to keep a long-distance friendship with Kaneshiro. When this school year ends, Schuessler hopes she will meet with Kaneshiro soon afterward.